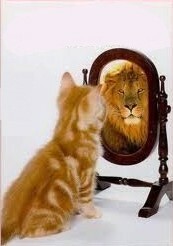 Sow What You Will Be And Are Not, Not Show What You Will Be That You Are Not! To not show what you are not is the wisest thing to do, when you are sitting across the table to a man who can easily make out that you are simply projecting an image of yours that does not belong to you. But when you do not know the person is someone who could actually catch you red-handed while you are trying to neatly knit a virtual image of yours, what should you do? They say it's important that you sometimes show what you are not and you would eventually become what you showed. Help the other person believe in your potential to become what is needed but you are not, and assure that you would be with enough proofs of times when it has happened, that you have not had certain qualities and have developed just in time when required. "Believe in making things happen with what you have, and developing all that you don't have!"